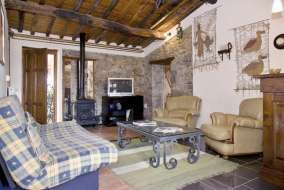 Elegant traditional Tuscan 'palazzo' located in a village at the start of the Pescaglia Valley. The property, which is four self contained apartments, is being sold furnished and is currently run as a B & B business. There are good views from many of the rooms. The property is 587 metres above sea level. Can arrive outside the property with a car, to unload shopping and suitcases. Public car park 50 metres away. Energy classification: G Performance index: 316.5 kwh/sqm p.a.